The number of creatives I have met over the past year that have completely ditched their digital cameras in favour of their phones is incredible. In fact, it seems most of my favourite instagram accounts have never in their life picked up a massive SLR. I, on the other hand, have been lugging around three to four cameras daily, no matter what's on the itinerary. I have found I always need the camera I've left at home. So yes, I'm the lady who is old before her time because my handbag is the size of my entire upper body. Naturally, you can see why I might be skeptical about new technology and the way in which a phone could replace my massive investment in cameras. However, last week I attended the launch event of the new Huawei Mate 10 Pro, which was launched with an inspiring campaign entitled I am What I do, which showcases how AI technology can enrich people’s lives and help people do great and life enhancing things. A handful of digital influencers were invited to the launch which was, interestingly enough, situated in a dark restaurant. Queue the panic. Why on earth would anyone choose a dark restaurant, with dark tables to showcase a new tool in photography? Well, all was revealed pretty quickly. The Huawei Mate 10 Pro loves the low light. Well, nothing capable of taking a picture really loves low light. So let's put this another way. The Huawei Mate 10 Pro exceeds all expectations in low light. And this situation definitely put it to the test! Alright, I'm getting ahead of myself. Shall we get some the tech talk out of the way? Let's bullet point this bad boy. What's so great about the Huawei Mate 10 Pro? Let's start with the camera itself, which is a Leica Dual Lens f/1.6 Aperture. This allows users to easily take crisp photos in low light conditions, create stunning imagery with shallow depth of field and even take complicated shots, like sports photography, with minimal blur. The phone itself is the smartest best friend you'll ever have. 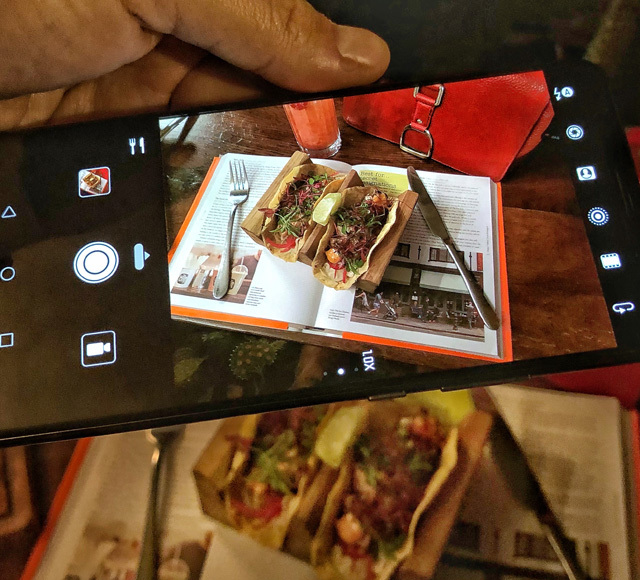 When you focus on an object, the phone will automatically recognise what you're shooting, whether it's a puppy or a plant, food or even a portrait, and will automatically adjust colour, contrast, brightness, vibrance and more, to get you the perfect picture with minimal effort. The Huawei Mate 10 Pro features the world's first AI (artificial intelligence) processor for smartphones meaning the phone learns and thinks just like we do, allowing it to constantly improve its performance and efficiency. Have a problem with your phone dying? Get ready for a life changer. 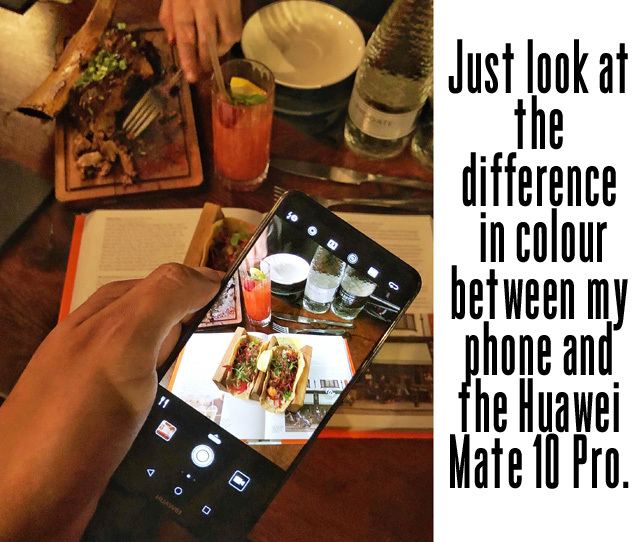 The Huawei Mate 10 Pro can recharge in 20 minutes with enough power to get you through a full day of using your phone (this just happens to be one of my favourite features... one coffee in Starbucks with a plug and you're back on your feet with your phone). There's even an accelerated translator which instantly translates text, voices and images into over 50 languages. Talk about breaking down the language barrier! Ladies and gents, there's even a mirror function on the phone. How can you not love that? I think you get the point that this is a new machine all together. And yes, I could continue to wax lyrical but I'll just leave you with this. It's been five days since I have had the phone in my possession. I've taken photos with it, I've used it for social and I've repeatedly stacked it against my current phone that I have on contract. I have to say it's the first piece of tech that has made me think I should be considering a switch over to an Android world. Even their ad campaign lends itself to making me think I've been playing this whole mobile game the wrong way. Huawei teamed up with tech-driven entrepreneurs for the "I am What I Do" campaign to showcase how the phone fits into the lives of innovative spirits who rely on technology to help them bring forth their best visions of the future. Fashion Foie Gras worked in collaboration with Huawei on this post.